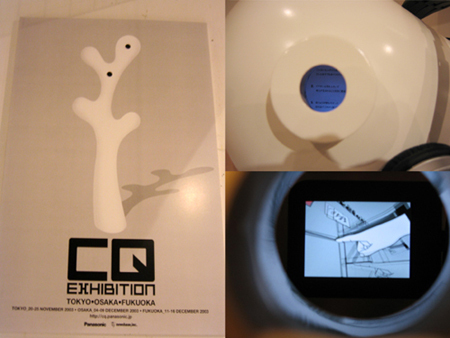 “CQ” exhibition was held at “Ex’ream”, a cafe in Harajuku. “CQ” is a community that creates visual contents that have a “new value” using the next generation’s mobile tools. Twelve artists were invited from New York, Los Angels, UK, Japan and more to participate in this exhibition. The visual contents they created can be seen through small windows on the mobile tools. The Resfest was held at the same time, so there was a section for Johnny Hardstaff’s works, too.”Nyoro”, the Gelchop work, is like a plant and the shape of it is very unique. 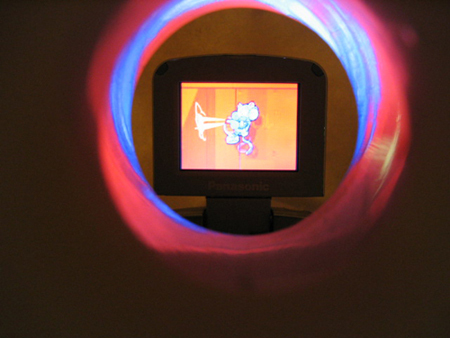 Nyoro is a device through which one watches the visuals. It has some small holes and people have to look into it in order to watch the visual. 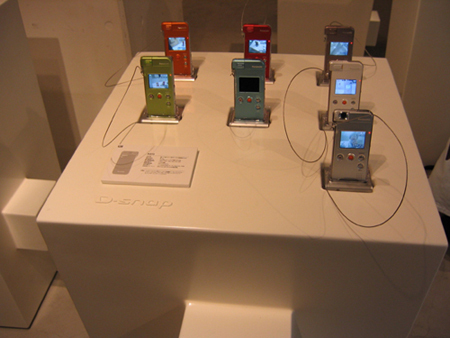 The original mobile tool “D-Snap” is too small to concentrate on the visual contents, but the process of looking into the holes makes people concentrate on the small displays. People could feel like they are taking a trip to another world by staying at the public space. 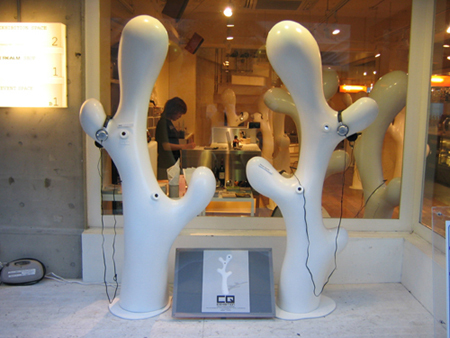 Besides, sounds were not able to be heard without headphones. There were many Nyoro with holes, and people have to go close to the holes and look into them in order to watch the visual contents. The first hole I looked into was at the side of the entrance. The visual was a motion graphic work created by Atsushi Toyama. The visual of animals he painted were moving around. It was like a fairly tale world. Next to his work there was a visual of graffiti art created by “Kerb”, a group in the UK. In it, a robot like cat, is drawing graffiti of a skeleton on many kinds of buildings. There were many Nyoros on the floor. The exhibition was divided throughout two stories, the cafe on the first floor and the gallery on the second floor. 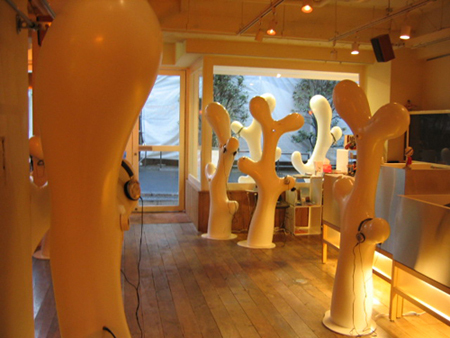 Although the cafe was opened as usual, Nyoros were displayed on the first floor. Customers enjoyed drinking tea or eating something. In this situation, to look into the hole felt special. Prefuse 73’s PV and Ed Holdsworth’s works, who took part in Resfest, were very impressive. The two parts-the scene of city and the nature – were created by using the same technique, but it gave us a totally different impression by mixing different information with them. On the other hand, two Nyoros on the second floor were also interesting. 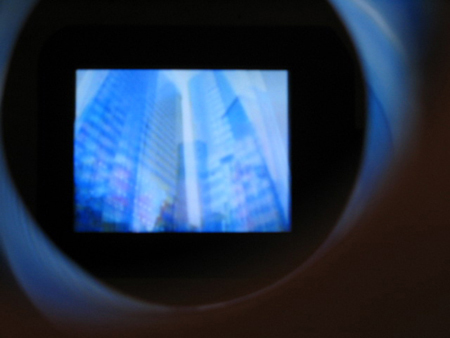 The visuals were named “Poetry” in which TANKA, given by Kouichi Masuno, were turned into visuals by creators. Poetry is on the “CQ” web site now. On the whole, each visual was short (about a minute), but each one had an original world. This time, the identity of Resfest was a baby robot, and Johnny Hardstaff said the works of creators are like a kind of baby. 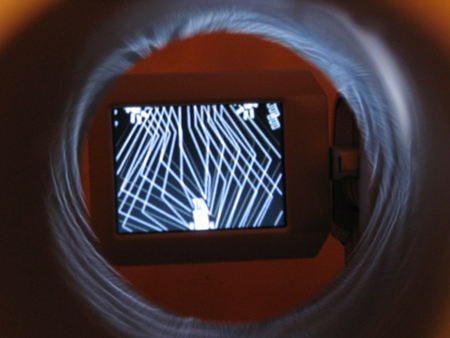 The evolution of mobile tools brought a new type of entertainment visuals on small displays. Probably, the visuals are the baby of the future. While the exhibition in Tokyo is over, it is going to held in Osaka and Fukuoka.. I recommend to go and feel them for yourself.